BRIGHTON, Mich - First things first, a big congratulations is in order to the Seattle Seahawks for becoming the Super Bowl XLVIII Champions! Secondly, well done to all of the creators of each of the Super Bowl Commercials. Of course, we did favor Ford Motor Company's "Nearly Double" 2014 Ford Fusion Hybrid commercials and not to mention, reaping benefits that come with this technically advanced vehicle. Whether you missed the commercials or are unaware of what this outstanding vehicle has to offer, this one is for you! Now, lets talk Hybrids. The 2014 Ford Fusion Hybrid has an EPA-estimated rating of 47 miles per gallon if you are driving in the city, on the highway, or a doing a little bit of both. 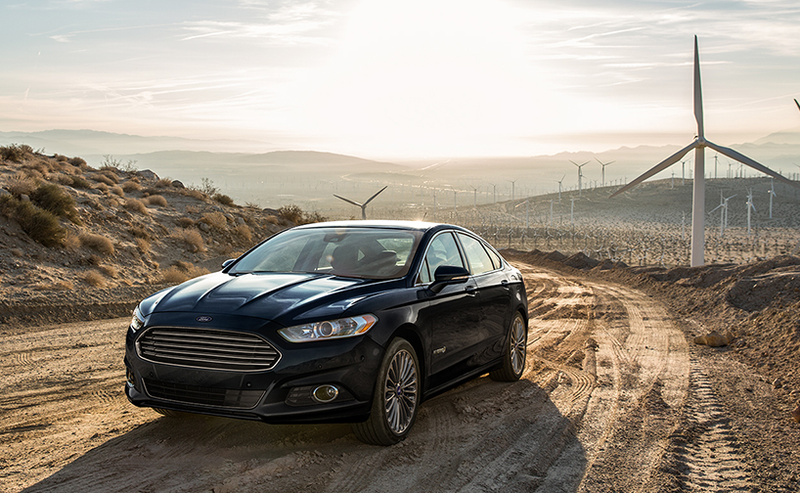 The Fusion's gas engine and electric motor combination give it a nice boost of 188 net horsepower. On electric power alone, the vehicle is able to travel up to 85 mph. The 2014 Ford Fusion Hybrid has an impressive brake system that not only captures 90 percent of energy that is normally lost through heat while breaking, it also recycles energy to recharge the hybrid's battery. The Fusion has been designed to provide seamless, gearless shifting. It compensates for changing the vehicle speeds while keeping the engine at the highest level of efficiency. The aerodynamic design reduces drag and increases efficiency with the active grille shutters and fully shielded underbody. To truly see the major efficiency of the 2014 Ford Fusion Hybrid for yourself, Ford is offering customers the opportunity to Calculate Your Fuel Economy . Enter your vehicle model, year, and brand and Ford will show you if Ford can nearly double the fuel economy rating of your current vehicle. What do you think of the "Nearly Double" 2014 Ford Fusion Hybrid? Test the efficiency yourself and calculate the fuel economy of your current vehicle. Brighton Ford is proud to offer the latest Ford vehicles at the dealership. Whether you are looking for the 2014 Ford Fusion or a Used Ford Fusion that is in great condition, we are the dealership for you!